The Foundation for a Healthy St. Petersburg and Pinellas Education Foundation have embarked on a strategic partnership to further equitable educational outcomes and boost education quality for all Pinellas County students. The partnership has launched the first two in a series of research reports on key topics, titled Focus on Education. Why have the Pinellas Education Foundation and the Foundation for a Healthy St. Petersburg joined forces? The short answer: Educational equity. We want all students to have an equal chance at a high quality education. Together, we are supporting Pinellas County Schools in leading the region and state in equitable student outcomes at all grade levels across the county. By combining our expertise, time and financial commitment, we are dedicated to preparing all students for life after high school, whether the path is college, career technical education, the military or joining the work force. To accomplish this objective, we needed to gain a deeper understanding of the educational landscape in Pinellas County. That has led to the release so far of two in-depth reports: a comprehensive look at indicators for post-secondary educational attainment, and our latest study – an exploration of Career Technical Education trends in Pinellas County. Our next report will examine high school indicators of success. We want to identify areas of accomplishment as well as opportunities for improvement. Our goal is to foster community dialogue, engage stakeholders and initiate an action plan based on report recommendations. Our inaugural report explores the many ways students in Pinellas County are being prepared for multiple pathways following high school, including career training, technical education, and four-year colleges. The report identifies 14 indicators tied to post-secondary success for further examination. Out goal is to explore how to move the needle as a community to improve student outcomes and assure educational and opportunity equity. 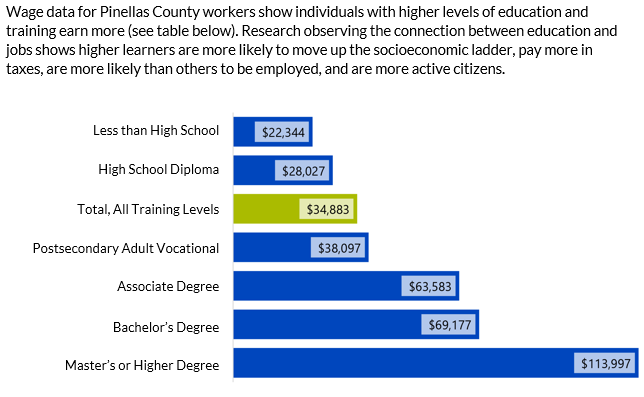 ■ Wage data for Pinellas County workers show individuals with higher levels of education and training earn more Research observing the connection between education and jobs shows higher learners are more likely to move up the socioeconomic ladder, pay more in taxes, are more likely than others to be employed, and are more active citizens. ■ While not every student needs to attend a 4-year university to lead a successful life and secure a well-paying job, research indicates individuals who earn a credential beyond a high school diploma earn more over their lifetimes and are less likely to be unemployed. ■ In 2016, Florida ranked 24th among all states in degree attainment. In Pinellas County, 42% held such a degree, making Pinellas 10th among all Florida counties in degree attainment. Our second report examines the growth and tremendous importance of Career Technical Education (CTE) in Pinellas County, noting that CTE is vital in meeting the needs of employers by effectively preparing students for the work force. Case in point: By 2020, nearly two-thirds of jobs will require postsecondary education or training and nearly 60% of employers nationally report that high school is not preparing students for college or careers. Career and Technical Education can bridge that gap. ■ In Pinellas County Schools, there are 46 CAPE academies in 17 high schools. CAPE academies follow a rigorous curriculum organized around a theme and prepare students for careers and postsecondary education. The number of students participating in CAPE academies has increased over the last three graduating classes from 38% to 44% of all students. ■ Across all programs, in three years, the number of students earning industry certifications has almost doubled (1,070 to 1,949 students); the average number of certifications per student is also increasing. ■ Pinellas Technical College offers short-term programs leading to middle- and high-wage, in-demand jobs, meaning that students can be in a career within a year. At Pinellas Technical College, 85% of students complete their program and 96% are placed in jobs.